Update to this story at 20 Feb 2018: I’ve been debugging the problem together with Apple and I feel like we are closing in on a solution. My current guess is that Finder indexing needs a lot more time on High Sierra than on Sierra clients. Update to this story at 6 July 2018: I’ve been asked by Apple to verify and can confirm that OSX Mojave Beta no longer has this problem. We’re into video archival here, and we like what we do. For about 30 years, we’ve been digitizing, storing and collecting Video-Based Artworks, documentaries and short films for preservation to our future generations. We’re talking artists like Vito Acconci, Nam June Paik, Wolf Vostell, Lawrence Weiner, Jef Cornelis, Johan Grimonprez, Steve Reinke, Walid Ra’ad, Jordi Colomer, Beatrice Gibson, Hans Op de Beeck, Emily Vey Duke & Cooper Battersby, Julia Meltzer & David Thorne, Manon de Boer and many others. And I have one particular server that we have loved for a long time. It’s the one that holds our video files. It sits safely in a small server room. And it’s back-upped to a large dual LTO Library + Off-site backup in a Bank Vault! And it has a bunch of 10G Ethernet interfaces! And it has some ATTO ExpressSAS interfaces to connect it to 7 RAID6 arrays! And we use Apple’s AFP (Apple Filing Protocol), easily reaching just over 100MB/s transfer speeds on plain CAT6 cables. And it doesn’t even sweat under load! We love it! It’s lightweight and all our video editors, annotators, archive ingest people and media library visitors can use it simultaneously without much hassle. Let that sink in. They. can’t. search. files. anymore. I admit, it took me a while to even consider the clients to be the problem. Surely Apple wouldn’t break AFP support on it’s clients? Surely Apple knows some institutes still use AFP servers, right? So thank you, Apple, for your advice when I called and opened a support ticket for this issue. Because you don’t sell any hardware that holds ATTO cards and 10G Ethernet cards any more. You’re asking me to reformat 300TB? You’re telling me NOT to upgrade? I switched to Mac about 10 years ago and loved how BSD-like it was. Hardware was solid and things just worked. 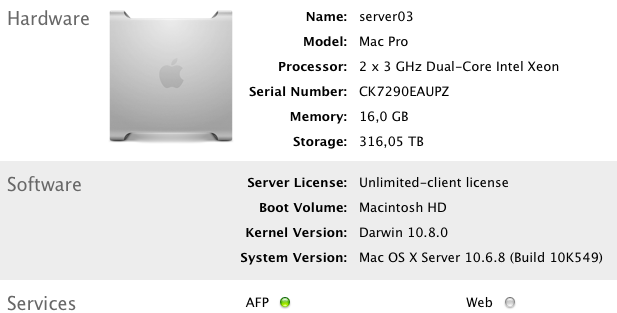 OSX Server was easy and pretty solid. Since then, I’ve seen a steady decline in quality and connectivity. At a time, I ordered a batch of 6 iMacs for our MediaLibrary for a total of 3 times. The oldest 6 from 2007 still run fine (iMac7,1), the second batch had one that broke down (iMac10,1) and the last batch has only 3 left standing (iMac11,2). Nowadays, I purchase iMac18,2’s to realize it has no thunderbolt2 but the black bin MacPro’s in our studios have 6 of them! Go Figure. 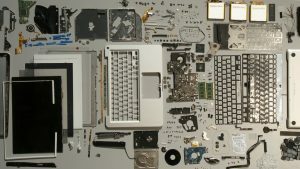 In 2010, an artist called Herman Asselberghs made a video wherein one sees the meticulous dissection of a brand new MacBook Pro. I used to watch this work in horror when I needed to quality control it in our video archive, it felt really bad seeing this beautiful piece a machinery being slowly disassembled. Nowadays, I enjoy watching it. I’m writing this on a Mac Pro (Mid 2010) and I still love it. Please let me keep it. Please don’t break anything anymore. Please fix AFP searching in High Sierra as well. FLOPS is a standard measure of computing power — “Floating Point Operations Per Second”. A GigaFlop (or Gflop) is a billion FLOPS. A TeraFlps (or TFlop) is a trillion FLOPS. So a 1 FLOP machine will do one “operation” in a second. A 1 GFlop machine will do a billion operations in a second. A 2 GFlop machine will do two billion operations in a second. ie, by this measure, a 2 GFlop machine will do twice as much computing work in the same time as a 1 GFlop machine. So in an hour’s work on a volunteer computing project, a machine that operates at one GFLOP will do one G-hour of work; and the same one hour’s contribution on a machine that operates at three GFLOPS (i.e., a faster computer) would complete three G-hours of work. A CPU is a computer’s processor (“Central Processing Unit”). The term CPU Hours (processor hours) is a measure of work done; a CPU Hour is the same as a G-hour, as described above. A with G-hours, note that a CPU-hour is is not a direct measure of time. Because some computers are faster than others, CPU Hours are reported in terms of a 1 GFLOP reference machine”. That is, An hour of work on a machine twice as fast as the reference machine is credited as Two CPU Hours. A CPU Year is simply the amuont of computing work done by a 1 GFLOP reference machine in a year of dedicated service (8760 hours). In place of G-hours, CPU Hours or CPU Years, you will in some places see the term Credits. One Credit is 1/100 of a day (14.4 minutes) of computing time on a 1 GFLOP reference machine. first, enable IMAP in gmail. first, enable POP for all mail in gmail. If you’re using Safari, there’s an easy way to download flash videos. Open the page with the movie and press Command-Option-A, which shows the Activity window. If you’re also loading other sites, you’ll see a list of them: scroll until you find the YouTube page and click on the arrow to show details about what is being loaded. You will certainly notice an element whose size is over 0.5MB (most of the time, over 5MB). Double-click on it (even if it is still loading), and Safari will download it. When the download is over, navigate to the file in the Finder (which will probably be called get_video) and add the extension .flv to its name. protocols Multicast DNS and DNS-SD. It is a system which facilitates service discovery on a local network. Bonjour and sometimes Zeroconf) and is very convenient. Can’t use string (“dbus-1.2.24p4”) as a HASH ref while “strict refs” in use at /usr/libdata/perl5/OpenBSD/PkgAdd.pm line 883.
is my cpu 64bit capable? -I –getinfo Print current wireless status, e.g. signal info, BSSID, port type etc. -s –scan= Perform a wireless broadcast scan. -P –psk Create PSK from specified pass phrase and SSID. Briefly, free memory is available to be used right now; wired memory is basically system memory for the kernel and other stuff; active memory is memory being used right now; and inactive memory stores info from recently quit applications. The idea with inactive memory is that if you quit and app and start it up again it’s going to launch nice and quick because the info is still in RAM. There is a command called “purge” which can be used to free up memory. You should really use it sparingly (if at all) but it does actually free up all the inactive memory without having to reboot. IPMI basically allows for sysadmins to monitor and administrate a machine without having to go through the OS. This link (http://buttersideup.com/docs/howto/IPMI_on_Debian.html ) describes the hardware and software involved, which is called IPMI and stands for Intelligent Platform Management Interface. Although the HOWTO part didn’t apply directly to my particular solution it cleared up a lot of my confusion over where these arps were coming from and why. It is useful to know a bit about how IPMI does its stuff – so I’ll give an overview, and try to bust some weird IPMI/Intel jargon. There is a second autonomous computer on the motherboard (or baseboard, in IPMI’s politically correct / obfusicated language), this is a very simple, low power-consumption device, which should operate as long as power is connected to the machine (including when the majority of the server is powered down) – in IPMI speak, this computer is called the BMC – the Baseboard Management Controller – it uses its own firmware, which is independent of the system BIOS. If you have an Intel motherboard it comes with software to control the BMC in various ways, but unfortunately the software only works on Windows or Redhat/Fedora Linux, and after failed tries to get it to work remotely from another Windows machine and reading that the Linux package wouldn’t install properly on other versions of Linux (I didn’t try it on Ubuntu though) I decided to try the open source versions of IPMI. Freeipmi (http://www.gnu.org/software/freeipmi/) and openipmi are two such programs and freeipmi worked for me in the end. From this long thread (http://www.nabble.com/problem-with-freeipmi-0.5.3-and-intel-SE7221BK1-E-td14865773.html) I found I decided to try and load the three modules below, the third one gave me an error so it apparently wasn’t necessary, and in fact I don’t know if I needed to load any of them manually, but I went ahead and did it anyway. The options in the command are particular to motherboards using the SSIF driver, for other types of boards I’d suggest reading this general description (http://openipmi.sourceforge.net/IPMI.txt), this Ubuntu thread (https://help.ubuntu.com/community/IPMI) or this other thread (http://wiki.adamsweet.org/doku.php?id=ipmi_on_linux) (they didn’t work for me but helped my understanding). If anyone has any tips to add here please do, I arrived at this solution after lots of trial and error and I’m sure there’s a better/quicker way but this worked for me. 2.35:1 (“Scope”), The common anamorphic widescreen film format in use today. Sometimes referred to as the Movietone ratio, this ratio was used briefly during the transitional period when the film industry was converting to sound, from 1926-32 approx. It is produced by superimposing an optical soundtrack over a full-gate 1.33 aperture in printing, resulting in an almost square image. Films shot in this ratio are often projected or transferred to video incorrectly using a 1.37 mask. Examples of films shot in the Movietone ratio include Sunrise, M and Hallelujah!. 35 mm original silent film ratio, commonly known in TV and video as 4:3. Also standard ratio for MPEG-2 video compression. This format is still used in many personal video cameras today and has influenced the selection or design of other aspect ratios. It is the standard 16 mm and Super 35mm ratio. 35 mm full-screen sound film image, nearly universal in movies between 1932 and 1953. Officially adopted as the Academy ratio in 1932 by AMPAS. Rarely used in theatrical context nowadays, but occasionally used for other context. IMAX format. Imax productions use 70 mm wide film (the same as used for 70 mm feature films), but the film runs through the camera and projector sideways. This allows for a physically larger area for each image. The aspect ratio of 35 mm film used for still photography when 8 perforations are exposed. Also the native aspect ratio of VistaVision. Widescreen aspect ratio sometimes used in shooting commercials etc. 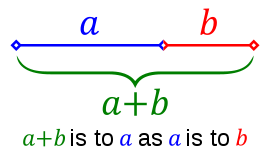 as a compromise format between 4:3 (12:9) and 16:9. When converted to a 16:9 frame, there is slight pillarboxing, while conversion to 4:3 creates slight letterboxing. Widescreen computer monitor ratio (for instance 1920×1200 resolution). 35 mm Originally a flat ratio invented by Paramount Pictures, now a standard among several European countries; native Super 16 mm frame ratio. Sometimes this ratio is expressed more accurately as 1.67. Early 35 mm widescreen ratio, primarily used by MGM and Warner Bros. between 1953 and 1955, and since abandoned. 35 mm US and UK widescreen standard for theatrical film. Introduced by Universal Pictures in May, 1953. Projects approximately 3 perforations (“perfs”) of image space per 4 perf frame; films can be shot in 3-perf to save cost of film stock. Original SuperScope ratio, also used in Univisium. Used as a flat ratio for some American studios in the 1950s, abandoned in the 1960s, but recently popularized by the Red One camera system. 70 mm standard. Originally developed for Todd-AO in the 1950s. Specified in MPEG-2 for 2.20:1 movies, but hardly used. As of 2010, TVs have been introduced with this aspect ratio and are marketed as “21:9 cinema displays”. This aspect ratio is not recognized by storage and transmission standards. 35 mm anamorphic from 1970 onwards. 2.39:1 is sometimes rounded up to 2.40:1. Often commercially branded as Panavision format or ‘Scope. Original aspect ratio of CinemaScope before optical sound was added to the film in 1954. This was also the aspect ratio of CinemaScope 55. Cinerama at full height (three specially captured 35 mm images projected side-by-side into one composite widescreen image). Full frame output from Super 16 mm negative when an anamorphic lens system has been used. 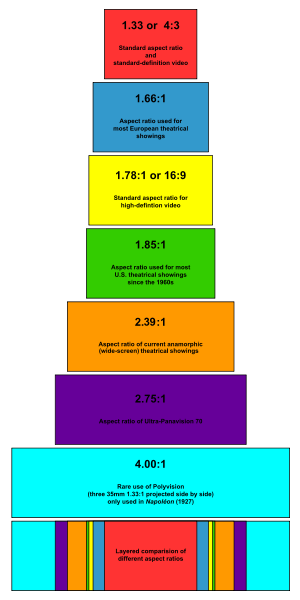 Effectively, an image that is of the ratio 2.66:1 is squashed onto the native 15:9 aspect ratio of a Super 16 mm negative. MGM Camera 65 (65 mm with 1.25x anamorphic squeeze). Used only on a handful of films between 1956 and 1964, such as Ben-Hur (1959). Rare use of Polyvision, three 35 mm 1.33 (4:3) images projected side by side. First used in 1927 on Abel Gance’s Napoléon. use ffmpeg to turn any video to “rawvideo”. pipe its output to *another* ffmpeg to turn the video to “yuv4mpegpipe”. pipe its output to the libtheora tool. for videos with audio, ffmpeg create a vorbis audio .ogg file. add tasty metadata (with liboggz utils). combine the video and audio ogg files to an .ogv output! Why the double pipe above? Some videos could not go directly to yuv4mpegpipe format such that libtheora (or ffmpeg2theora) would work all the time. We convert to yuv420p in the rawvideo step because ffmpeg2theora has (i think) some known issues of not handling all yuv422 video inputs (i found at least a few videos that did this). We do the vorbis audio outside of libtheora (or ffmpeg2theora) to avoid any issues with Audio/Video sync. AtomicParsley is distributed under the GPL “AS IS”, without any warranty; without even the implied warranty of merchantability or fitness for either an expressed or implied particular purpose. AtomicParsley is a command line program for reading & writing iTune-style metadata in mpeg4 files (m4a, m4b, m4p, m4v & mp4) whether iTMS drm protected or not. AtomicParsley can set most user accessible tags, and some that iTunes doesn’t let you change. Of particular note are the Mac OS X only image modification preferences that allow artwork to be modified prior to embedding. Artwork can be converted to jpeg, file size limited, reduced & squared through setting command line preferences. * album asset is only available on 3gp6 and later branded files. Note Mac users: iTunes looks at type/creator when opening an mpeg4 file. As of AtomicParsley 0.8.1, you no longer need to change extensions to/from anything – this is automatically determined through the information in the file itself and is set accordingly. A podcast mpeg-4 file may cause some concern at first because it shows up as being a protected file with a lock on the icon. This is nothing to be concerned about; iTunes uses the same icon/file info for ‘M4B ‘ and ‘M4P ‘ types – that’s it. They aren’t drm’ed in any way, just a sharing of icon/Finder info. Note2: iTMS purchased media often has ©day set to “2005-09-06T07:00:00Z” or something similar. This is normal and is called Coordinated Universal Time and is denoted by the Z at the end. iTunes only displays the year, but in fact there is an entire date that is there. Writing out is non-destructive – the original file is unaltered. There is a command-line option to over write the source file: use it with caution or on duplicates. Starting with version 0.9, AtomicParsley can used available padding to rapidly update tags. This option is only available with the –overWrite option. 3gp metadata assets are more complicated than iTunes-style metadata. Assets can be in either utf8 or utf16, and are for a specific language. Multiple like-named tags differing in the language are supported allowing for up to around 480 tags per asset. See the AtomicParsley –3gp-help page for more. 3gp assets are only available on 3gp files – setting iTunes-style metadata is not allowed. The only defined piece of metadata designed for descriptive annotations of the presentation/track is the copyright notice. If your file contains 4 tracks, there are 5 places to set copyright notices, max — each of the tracks + movie level. There may be multiple notices, differing by language & may be present at any combination of movie and/or track level in either utf8 or utf16. Defaults are lang=eng & utf8. Please note that at movie level, this notice is identical the the 3gp copyright asset, and if present for the same langauges this will overwrite the exising asset. According the the specifications for the mpeg-4 file format, any atom not listed is reserved & is unavailable for use. However, the specification & the mpeg-4 registration authority www.mp4ra.org allow for user defined extension via a mechanism called the ‘uuid’ atom. This type of atom actually has a ‘uuid’ name, but following that is 16 bytes (the actual UUID representation itself). Here you can see that after the hex-a-decimal representation of the uuid, AP has discovered an AtomicParsley-set uuid atom, and lists its name after APuuid). A fresh svn checkout will always be the most recent version available. AtomicParsley was developed on Mac OS X 10.4x, but should be able to compile on older versions. Only gcc4 was used to compile on Mac OS X.
AtomicParsley & new atoms, bugs, etc…. If you should come across an atom (in the moov.udta.meta.ilst hierarchy) that AtomicParsley doesn’t handle, please let me know about it – I would like to be able to support it. Note: AtomicParsley will never support iTunes-style “—-” atoms. To facilitate implementation, a sample of the new atom would be needed as it could come in a few different types – or even an entirely new type. Should you find a bug or a suspect behavior, please post to the bugs section or forum at sourceforge. A sample of the file that demonstrates the behavior would be best. Please also provide the name of the encoding program used to produce the file. Please refrain from using email as a primary means of support – it isn’t. Fun though it is to answer some questions repeatedly, imagine the fun a non-response would be. Please remember: as long as it works on Mac OS X – to me it works *perfectly* good enough. If you find a bug on another platform (probably Windows, because Linux will have most of the same encoders as on Mac OS X) or with any form of commercial encoder, a sample would probably go a long way to making AtomicParsley work on your files. • Many of the iTMS (both drm and podcast) files have **ID atoms. What they stand for can only be guessed, but their values have meaning only to Apple – as such they are displayed in raw hex. Since all metadata can be stripped (including these **ID atoms), and a drm file still plays properly, these tags can be considered superfluous metadata. • iTunes 7 incorporates a feature called gapless playback. For unknown reason, iTunes incorporates NULL space at the end of mpeg4 files. This may (or may not) be part of the mechanism iTunes uses as part of its gapless playback. Normally, this NULL space is replicated when AP writes out. It is not if DEFAULT_PAD=0 is set. Sometimes this a good thing, but often there is a catch. We don’t always remember the content of that what we forgot, but the subject of it sticks in our head. Like that title of that song by that artist you can’t remember or that amazing page from a book you loved. Now everyone has his or her own system to keep this information somewhere, and we are very capable to keep massive amounts of data in our brain without noticable effort. However, this does not share the information outside your personal sphere. So, for you, here are my pieces of information I’d like to share.